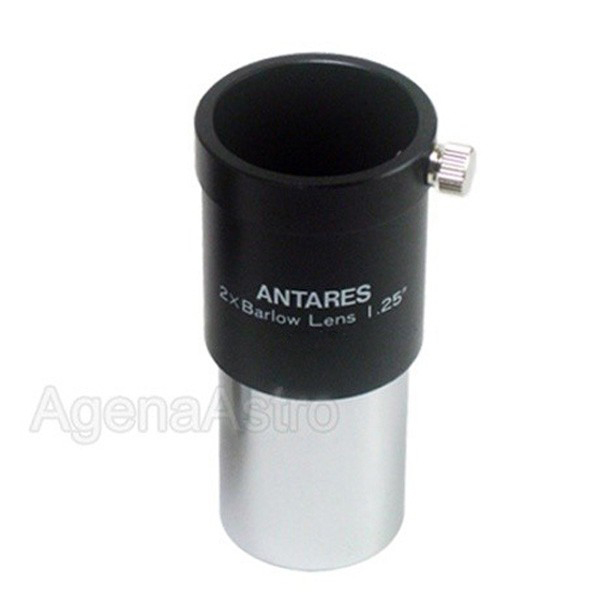 This high performance Antares barlow # UB2S doubles the power of any inserted eyepiece. It features a fully-multicoated achromatic design, internal darkening and edge-blackened lenses.Suitable for high contrast, high power applications in any telescope. Threaded to accept standard 1.25" astronomy filters. Made in Canada using Japanese optics (not made in Japan as indicated in the photo). Review by Tower3 of San Diego. I'd been looking for a decent Barlow to replace the one that came in one of those lens/filter kits in the metal case. In fact the only thing I use now from that kit is the case itself. The replaced unit had a serious problem with chromatic aberation, I didn't realize the problem until I started getting decent eyepieces. This Agena unit has turned out to be a very good purchase the improvement is immediatly noticed and fairly dramatic. I've bought my last 2X Barlow.